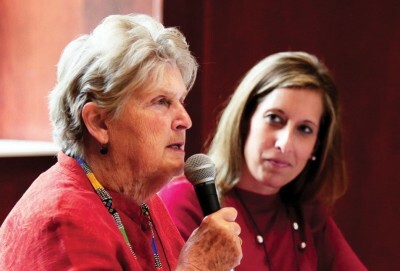 Ginny Pearsall Kirkwood (left) speaks at the 2016 Women of Ohio Wesleyan leadership forum held on campus with fellow panelist Denise Sabo Brenner ’00. Virginia “Ginny” Pearsall Kirkwood joined the Peace Corps immediately after her graduation from Ohio Wesleyan in 1964, just three years after the volunteer organization was created. It’s still her favorite topic. Kirkwood spent two years in Turkey working in two orphanages. In Kirklareli, she worked to increase community involvement, including organizing a coat drive for the mostly 3-to-7-year-old residents. “The kids never left the building from October to April because they didn’t have coats,” she says. Kirkwood was the first in her family to get involved in the Peace Corps but was followed by her mother and father, who spent two years volunteering in Malaysia. Kirkwood’s niece, Carrie Hessler-Radelet, was stationed in Western Samoa from 1981 to ’83 and later became director of the Peace Corps under President Barack Obama. From 1990 to 1993, Kirkwood herself served as director of the Peace Corps in Thailand, the second-largest country program at the time. She oversaw 600 volunteers and focused on AIDS prevention programs and sustainable engineering projects, and she remains on the advisory board today. She and her husband, Charles, now live in Shawnee-on-Delaware, Pennsylvania. Her family owns a golfing and ski resort in the town, and this past August, her community held a conference for 250 former Peace Corps volunteers.